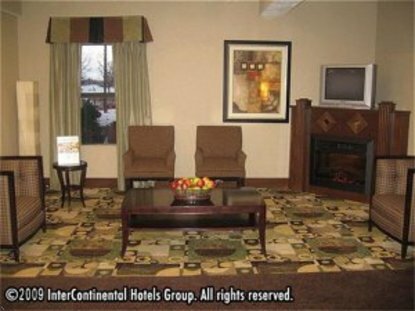 The Holiday Inn Express of Oakwood Village promises an outstanding and fulfilling stay. Our hotel is centrally located between Cleveland and Akron/Canton airports @ I-271 and Broadway Ave. We invite you to embrace our newly remodeled hotel. As you enter our front door your luxurious stay begins. Our top of the line Front Desk staff wait with a smile and a snack for all guests and will be sure to meet any of your needs, big and small. Once you enter your room, be sure to take a good look around. From plush carpeting to pristine bedding, each and every guest room has been remodeled to better serve your needs. We offer complimentaryWireless Internet Access which is located throughout the entire hotel. We have an indoor pool, whirlpool and sauna to help our guests relax after a long day. The smell of fresh baked cookies fills the air every night, beckoning you to the front desk to try one for yourself. Our Express Start Breakfast Bar has a multitude of choices to offer to start your morning right. We are not your typical hotel and will not treat you as &regjust another guest&reg like some of our competition will. We strive to make your top priorities our top priorities with a 100 % guest satisfaction guaranteed. So, next time you travel, Stay SMART with the Holiday Inn Express of Oakwood Village This hotel is committed to providing accessible facilities under the American Disabilities Act. If your accessibility needs are not met, please contact the Hotel Manager on Duty. Should you require additional information regarding accessible facilities for guests with disabilities, please call 1-800-Holiday (U.S. and Canada) or contact the hotel directly. For the hearing impaired, TDD service is available at 1-800-238-5544 within the U.S. and Canada.